I've come under some fire on Internet forums for "misrepresenting" the GPC concept as being heavier than it would in actuality. While I feel that the concept in my The Case Against article - though constrained by several requirements set forth by some members on Mr. Williams' forum - is a perfectly valid approximation, today I hope to address this complaint by creating the absolute lightest GPC estimate I possibly can while still sticking to conventional ammunition design and fulfilling the basic requirement that it not have any less residual energy at 1,000 m than M80 Ball. First, I need to recall that M80 produces just over 410 J at that range (.195 G7 BC, 2,750 ft/s muzzle velocity, Army Metro atmospheric conditions). 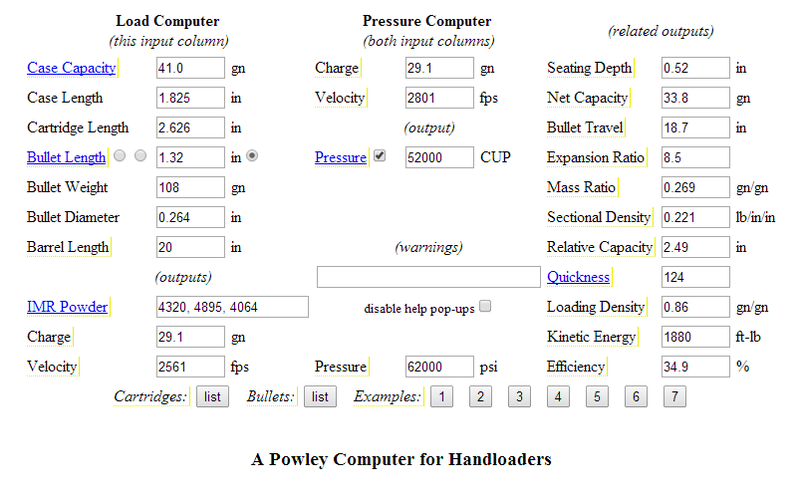 You can see this for yourself if you head over to JBM's ballistic calculator and plug in the appropriate values. My GPC must meet or exceed this value. To really get the lightest weight possible, I'm going to need a very good form factor for my bullet- since this is all about retained energy at range. The best form factor I know of for a service projectile is .889 i7, and belongs (paradoxically) to the first spitzer rifle bullet to see service, the French Balle D, an all-brass 12.8 gram boattail projectile with a fairly unique design. If I scale that bullet down to .264" caliber, it weighs just under 7.2 grams. These are some very impressive ballistics! Now, let's see how much this performer would weigh. To shave as much weight as possible from the design, I am going to use M855A1's peak pressure of 62,000 PSI, as well as the same case taper and shoulder angle of 5.56. Many have argued that 62,000 PSI is too much pressure for a rifle cartridge, and that 5.56's case taper and shoulder angle are a detriment to its reliability in automatic weapons, which is part of the reason why my last estimate was so heavy. This time around, I'm pulling out all the stops; no expense will be spared making this GPC as light as I can. In my opinion, the .5 degrees case taper and 23 degree shoulder of the 5.56mm are adequate, and the 62,000 PSI peak pressure is made safe by more thermally stable propellants. I will move on. Judging by the propellant weights of both the 6.8 SPC and the 6.5 Grendel, though, that 29.1 grain charge weight seems a little light to me. 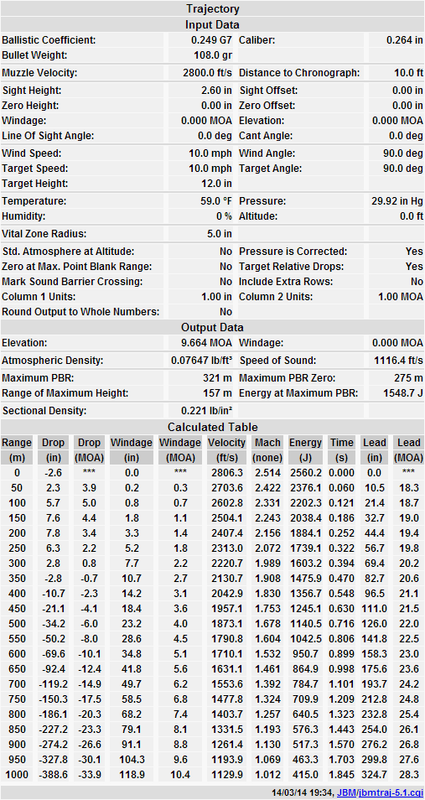 A spit-in-the-wind estimate puts me at 34.7 grains charge, which sounds more reasonable. Now, we can figure out how much the cartridge weighs. As my readers can see, even this extremely optimistic estimate still adds almost fifty kilograms of ammunition to the infantry platoon (to say nothing of the increase in weight from the heavier belt links, magazines, and weapons that would be needed to chamber the cartridge). I've heard some GPC proponents claim that the savings in weight of a GPC vs. 7.62mm would balance out its increased weight vs. 5.56mm weapons at the platoon level; this is clearly not true. The GPC - even the lightest possible GPC - represents a significant weight increase for the infantry rifle platoon (or a corresponding reduction in rounds carried). Further, even replacing the platoon's 60mm mortars with direct-fire recoilless rifles is lighter than switching whole hog to the GPC. The Army has already decided to introduce Carl Gustafs to the infantry, which in my mind neatly solves the issue of having to call in air or artillery support when under fire from long-range Taliban ambushes; this being the primary rationale for the GPC in the first place. If the mortars are left home, American soldiers will be able to project high explosive firepower at long ranges without the need for an expensive and time consuming ammunition change-over, and with no more additional burden at the platoon level than would result from fielding a GPC. This cartridge I've designed is an impressive ballistic hot rod. It would make some sense for 7.62mm weapons to be replaced with weapons in a similar caliber, retaining the capability of that round while slashing the weight of ammunition by about 30%. I felt much the same in my initial article about my 20 gram GPC estimate. Anything that reduces the soldier's load without reducing capability or introducing problems is probably worth doing, if you can afford it. What I disagree with is the idea that a cartridge such as this should be a general purpose cartridge; that it should be issued to riflemen as well as designated marksmen, machine gunners, and as ammunition for static machine guns. The additional weight of ammunition and rifles, and increased recoil and size, sours the idea considerably in my mind vs. the two caliber system. I could be wrong, but I don't remember anyone saying that the GPC would need to equal the M80 in energy, just in penetration/perforation, which means that the energy can be lower. In that vein, I used LoadAmmo to estimate the case capacity of a 6.5mm GPC based on the 6mm SAW, but with the neck shortened by 3mm and the shoulder length adjusted accordingly. This gave me a case capacity of approximately 34.3 grains of water. Next, I found a drawing of the Balle D (http://i274.photobucket.com/albums/jj263/EOD72/157_zps3a38eb39.jpg) and estimated it (http://www.geoffrey-kolbe.com/cgi-bin/drag_working.cgi?unit_length=mm.&weight_unit=grains&bullet_name=Custom+bullet&re_calculate=yes&diameter=8.325&length=39&nose=24.375&meplat=1.24875&drive_band=8.325&base_diameter=6.8&angle=4.6&boat_tail=9.335&secant_radius=&weight=199&density=8.7). 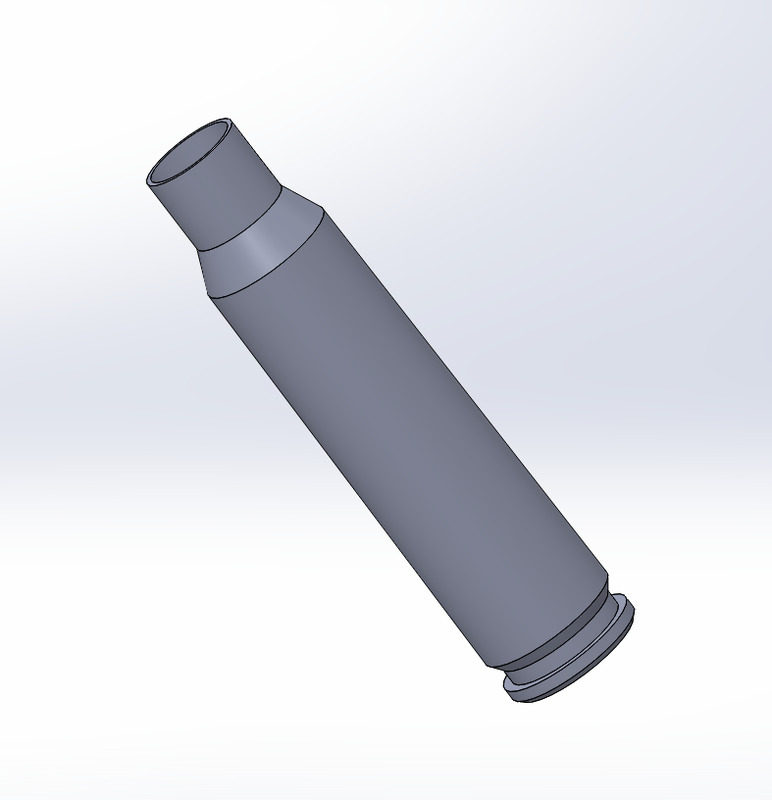 This turned out pretty well okay, so I used caliber ratios to scale it down to 6.5mm (http://www.geoffrey-kolbe.com/cgi-bin/drag_working.cgi?unit_length=mm.&weight_unit=grains&bullet_name=Custom+bullet&re_calculate=yes&diameter=6.7&length=31.389&nose=19.618&meplat=1.005&drive_band=6.7&base_diameter=5.474&angle=4.6&boat_tail=7.511&secant_radius=&weight=103&density=8.7) and then adjusted it to have the same SG as the M855A1 according to another estimation, while keeping the weight at 7 grams (http://www.geoffrey-kolbe.com/cgi-bin/drag_working.cgi?unit_length=mm.&weight_unit=grains&bullet_name=Custom+bullet&re_calculate=yes&diameter=6.7&length=33&nose=19.618&meplat=1.005&drive_band=6.7&base_diameter=5.474&angle=4.6&boat_tail=7.511&secant_radius=&weight=106&density=8.6). This turns out to match your length and calculated BC pretty well, so I'm going to use the estimated BC. I put the bullet into LoadAmmo and found that, at just under the 62kpsi limit you've set, it's possible to get a MV of 790 m/s using 27.3 grains of AR2206, which is good, because ADI powders are well known for thermal stability, so that should lessen the chances of pressure spikes (https://www.dropbox.com/s/a4cgvwy0qh5shcw/6.5x45mm%20GPC%20%28LoadAmmo%29.png). Of course, this round now only produces 343.5 joules at 1000 metres, almost 70 joules less than the M80 ball, but what happens if you compare their ability to perforate metal? The bullet's performance at 1,000 metres should be comparable with the 7.62 M80 ball, as measured by hit probability (a function of trajectory, flight time and susceptibility to wind drift) and damage potential (bullet energy and penetration). Which means that, rather than being forward thinkers, GPC proponants are actually arguing to keep the 19th Century US Army requirement (shared in similar format by ALL of the "full power" service rifle cartridges from the late 19th Century) from the CIVIL WAR that the rifle cartridge be capable of killing or disabling a horse at 1000 yards. Yup, that's what the performance spec of the M80 round calls for -- because the development requirement specifically calls for range and terminal performance no less than the .30-06, which had to meet or exceed the previous US Army performance (.30 Krag), which had to meet or exceed the .45-70 performance, which explicitly called out the anti-equine Pk requirement. And you know what? 7.62x51mm IS a really good round to kill or disable horses at long range with. It's just that it is not a very realistic Pk requirement anymore. . .
Let's go back to the drawing board, and come up with a rifle that is truly deserving of issue to our men & women on the bleeding edge. Let's not worry about the Gauss guns in the pipeline; we'll get them eventually, but let's focus on the here & now & utilizing the best practices of established technology [ie, no DI gas system, etc] instead of something pie in the sky in the sweet bye & bye, mmm'kay? Weird, because my Colt 6920 works just great with steel cased ammo. The rest of your argument is circular: "We need a 6.Xmm GPC because we do". Sorry, try again, because that's not gonna hold a lot of weight around here. Using JBM's Krupp's Formula function, I compared the two. By 500 metres, the 6.5mm round outperforms (https://www.dropbox.com/s/nw5dvjdp4uwpwaq/6.5x45mm%20GPC%20%28Krupp%29.png) the 7.62mm round (https://www.dropbox.com/s/9iq1bqq1dpftb67/7.62x51mm%20%28Krupp%29.png), and continues to do so. This is further demonstrated using Tony William's proposed indicator for AP penetration (joules/cross-section area in mm2). The 6.5mm projectile has 56.239 J/mm2 at 100 metres, 39.955 J/mm2 at 300, 27.541 J/mm2 at 500, 14.521 J/mm2 at 800 metres and 10.353 J/mm2 at 1000 metres. In comparison, the 7.62mm has 61.535 J/mm2 at 100 metres, 40.577 J/mm2 at 300, 25.559 J/mm2 at 500 metres, 11.529 J/mm2 at 800 metres and 9.154 J/mm2 at 1000 metres. The 7.62mm holds the perforation advantage at common infantry ranges (<300 metres), but the 6.5mm has the advantage at typical DMR and MG ranges. So, we can make a GPC that outperforms the M80 ball round at ranges past 500 metres, but what does it weight? Unfortunately for me, I don't have access to any fancy modelling programs, and wouldn't know how to use them if I did, and I couldn't find the case weight for the 6mm SAW, so I'm going to do a bit of a dodgy. Lake City brass weighs 92 grains/5.961 grams (http://www.6mmbr.com/223Rem.html), with a case capacity of 30.6 grains. According to municion, the base diameter is 9.49mm (http://www.municion.org/223/223.htm). The 6mm SAW's base diameter is 10.28mm (http://www.municion.org/6Mm/6x45Saw.htm), or 7.685% larger. Scaling the case capacity of the 5.56mm up by that much gives us a case capacity of 32.952 grains, and scaling the weight up gives us a weight of 99.07 grains/6.42 grams. Now, this obviously isn't 100% accurate, just look at the differences in case capacity, so naturally I need to check this against something else. The 6.8 SPC is 5.435% shorter, so this increase case weight to 125.151 grains (http://68forums.com/forums/showthread.php?12757-Case-capacity-and-variances-between-the-MFR-s). Now, the base is 10.63mm in diameter (http://www.municion.org/6Mm/6_8x43Spc.htm), which is 3.293% larger than the 6mm SAW. This gives us a case weight of 121.03 and capacity of 35.588 grains. Since it's obvious neither method is particularly good at getting the capacity right, it's probably safe to say that neither gets the weight right, either. Still, I don't have any better way to do this, so I'm going to average the two. This gives a capacity of 34.27 grains and a weight of 110.05 grains. The capacity is pretty well spot on, so I'm going to use the weight as well. So, with a case weight of 7.131 grams, primer weight of .35 grams, charge weight of 1.769 grams and a projectile weight of 7 grams, we get a total of 16.25 grams for a brass cased round, or 15.787 grams with a 6.668 gram steel case. I'll just round that up to 15.8 for the sake of simplicity. So, for a typical infantry squad, we have 23.226 kg worth of unlinked ammo (1470 x 15.8), and 50.372 kg worth of linked ammo (2800 x 15.8g rounds, plus 2800 x 2.19g links http://iaaforum.org/forum3/viewtopic.php?f=8&t=8073). That comes to 73.598 kg, by my count. Without the links, that's 67.466 kg. For comparison, including links, the squad load will have 39.452 kg (1.99g x 2800 links, plus 12.1g x 2800 rounds) of linked ammo, for a total of 57.239 kg. Now we come to the weapons squad. We have 20.698 kg of ammunition in magazines (15.8g x 1310 rounds), and 35.980 kg of linked ammo (15.8g x 2000 rounds, plus 2.19g x 2000 links), for a grand total of 56.678 kg (52.298kg without links). The weapons squad, without the GPC, will have 12.705 kg of 5.56mm ammunition in mags (1050 x 12.1g), 6.776 kg of 7.62mm ammunition in mags (280 x 24.2g) and 56.860kg of linked ammunition (2000 x 24.2g, plus 2000 x 4.23g links), for grand total of 76.341kg (67.881kg without links). I don't know why I get a higher weight than you, but I think I've shown enough working that you can probably figure out where I differed from you. The platoon headquarters will have 13.272kg of ammunition with the GPC as well (15.8 x 840 rounds). Total for the platoon? 290.744 kg (with links)/267.968kg (without links). Still more than 30 kg more than the current load out, but 62.932 kg (without links)/48.576 kg (with links) lighter than the current load out with M240s substituted in. So, for all intents and purposes, there's not much difference between our two rounds (except perhaps in link weight), and a squad as it presently is will have an increased burden if a GPC is adopted (of course, British and, it seems, Australian sections would welcome the decrease in weight). One thing that has now occurred to me, and which might perhaps make the whole post above actually contribute something useful, is that a two caliber system consisting of the 6.5x45mm round (either yours or mine, it hardly matters) and a lighter round might be something worth looking at. I have mentioned before that I'm not sure where the emphasis on replacing 5.56mm is coming from, other than that it's fashionable to hate on it at the moment. 7.62x51mm seems to clearly be the underperformer in the mix; if you were intent on replacing any small arms caliber, it would seem to me that it would be the one found most wanting. Then, at that point, can the requirements be relaxed a little bit? Maybe what you end up with looks more like .338 Lapua than a 6.5mm GPC. But then, who knows? A lightweight, but still just as capable round would be welcome, too. I think that GPC proponents feel both rounds to be underperforming, hence why the both need to be replaced. Of course, of the two, only replacing the 7.62x51mm will realistically result in a decrease in weight soldier's burdens. If you increased the OAL of the 5.56x45mm to 62.6mm, you could use a long, 65gr lead free projectile with a 0.2 G7 BC and a MV of 940 m/s with only a minimal increase in weight. Performance, while not GPC level, would nonetheless be pretty spectacular. I don't see any 7.62x51mm replacement looking more like the .338 Lapua than the 6.5 GPC, though. Yes, but for anyone else, that requires swallowing a whole series of gun-rag marketing and non-logic that really doesn't stand up to a solid analysis. 5.56, especially M855A1, works very well out to 500m. It makes an excellent carbine cartridge, and though you could make something better, until you start getting the same or better perforation performance with drastically lighter ammo, you won't see it replaced. Why not? .338 Lapua is more capable than 7.62x51; you could replace a whole slew of belted weapons with one FOW in one caliber. Screw the GPC replacing ammo that isn't inter-compatible anyway (e.g., 5.56 loose and 5.56 belted), you could replace .50 and 7.62x51 in one go, reducing actual commonality issues (e.g., .50 and 7.62mm ammo inside of an Abrams) while reducing the bulk and volume vs. .50 cal ammo. Or, what we have now might be good enough. 7.62x51 and .50 both have their unique perks, too. To do what you're suggesting, you'd want to use CTA or caseless, otherwise the ammunition is going to be too big and heavy. Since neither is likely to be adopted any time soon, I'd consider the GPC to be more likely than a .50 and 7.62mm replacement. CTA and caseless both have their own problems which are unlikely to be solved any time soon. However, don't think that those are the only two ways of reducing ammunition weight and bulk. You want to replace both the 7.62mm and the .50, so whatever round you come up with needs to match the .50 in hit probability and penetration, while not weighing much more than the 7.62mm. If you don't keep the weight low, you're just burdening the weapons squad, and if you can't replace the .50, you're burdening them unnecessarily while not reducing the logistics footprint any. How would you achieve this design? If you'd read carefully, you'd have seen that I wasn't advocating the idea, but rather saying that if replacement was your goal, it'd make more sense to start with 7.62 and .50 than 5.56mm. Bad choice of words there on my part, I didn't mean to imply that you actually thought that, just that that was what you'd proposed for this thought exercise. I agree with you in the sense that both the 7.62 and .50 could be replaced by cartridges that are more efficient, but trying to do a GPC on them will only lead to an even worse solution than the GPC is looking like. Maybe. However, it's the opinion of some (not mine) that .50 doesn't do much more than 7.62 on the battlefield, and is mostly kept around as a legacy weapons system. Given that 7.62 can be significantly improved upon, it might then make sense to issue a 7.62-sized cartridge as a replacement for .50 and 7.62 both, if those are your premises. I used .338 Lapua Magnum as an example earlier, but you could also do this with a cartridge no heavier than 7.62, I imagine. I do believe the 50 has seen its day. However the 50 gatling is a terrifying vehicle(only) weapon. But some armies are using more & more 338 sniper/anti material weapons. Right now the military uses too many calibers. A 338 lapua or Norma could replace the 50 & 30 cal. A more effective GPC would take up the slack. And forget about weight! Newer tech will eventually save considerable weight. New alloys, carbon fiber wrapped barrels, hybrid polymer cased ammo. It's time to think about what can be done & not about what can't. 5.56mm and SCHV cartridges in general would benefit more from these new technologies than a GPC would, because their projectile weight is a smaller percentage of their overall weight. The bottom line is that a GPC can't do anything that 5.56mm can't do. Why should armies adopt something heavier and no more capable? I am absolutely open to sound arguments on this, but it's about this time the GPC mafia starts yowling about poodleshooters and energy retained at a kilometer, and I can't take that kind of discussion seriously. According to LoadAmmo, the 7.92mm s.S Patrone (http://img34.imageshack.us/img34/5269/57745371.jpg) scaled down to 5.56mm (http://www.geoffrey-kolbe.com/cgi-bin/drag_working.cgi?unit_length=mm.&weight_unit=grains&bullet_name=Custom+bullet&re_calculate=yes&diameter=5.69&length=24.645&nose=14.667&meplat=0.854&drive_band=5.69&base_diameter=4.817&angle=6&boat_tail=4.119&secant_radius=12&weight=59&density=8.6) would reach around about 904 m/s from a 20" barrel using .221 Fireball brass and the 62kpsi pressure limit you've set. OAL has been increased to 51.23mm, for your reference. If .221 fireball brass is 5.417 grams (http://www.saubier.com/forum/showthread.php?t=21257), the primer 0.35g, the powder 1.089g and the projectile 3.629g, the whole cartridge would weigh 10.485 grams (10.133 grams with a steel case). Performance won't quite be as good as the M855A1 due to the lower MV and weight, but it should be closer to the M855 than the M193, so I don't think the difference will matter much. It would, however, save about 23 kg (not including weight savings due to lighter magazines and rifles). Just for fun, I did a 4.7mm round as well (http://www.geoffrey-kolbe.com/cgi-bin/drag_working.cgi?diameter=4.9&length=22.9565&nose=14.3472&meplat=0.735&drive_band=4.9&base_diameter=3.42323&angle=&boat_tail=5.4929&secant_radius=&unit_length=mm.&bullet_name=&weight=&weight_unit=grains&density=custom_density&custom_density=8.6&boundary_layer=L%2FT). From a .221 Fireball case, with an OAL of 51mm, a truly ridiculous velocity of 1050 m/s will be achieved with 20 grains of powder. This is sufficient to match and better the penetration of the M855A1 out to 1000 metres, and provides a much flatter trajectory with less windage and a shorter ToF. Surprisingly, the barrel life is only 165 rounds less than the M80 according to the spreadsheet you posted last month. Of course, the interesting thing now being discussed by Stan Crist on Tony's forum is what happens with the GPC concept if we go up against a proper army or insurgents who have a lot of body armour. The GPC may just not be able to cut it on those grounds. Which, of course, begs the question: what do you do when your enemies have armour than protects against your light and heavy platoon level rounds? Issue flechettes; technical problems with that concept be damned. Heh. It's going to be interesting to see how the next generation of flechettes look like. BTW, .35 g is the approximate weight of a Large Rifle Primer. Small Rifle Primers (such as 5.56 or .221 Fireball use) are approximately .25 g.
I like the .50 as an anti material weapon. It is common to need to stop an unarmored vehicle used as a IED delivery device. For Armor or Mech infantry the range is very useful, and the weight is of little concern. For light infantry it could be useful if only the HMG wasn't so darned heavy (84 lbs for M-2, more if on a tripod) I would suggest a low rate of fire 120 rpm weapon that used long recoil, weighing perhaps 15 lbs. The very low weight means that the 4 rounds to the pound ammunition could be useful for long range targets discovered by the infantry squad. If the light infantry was supported by a Big Dog robot or a living donkey, more ammunition becomes less of a problem. .300 AAC Blackout: The End of 5.56?